I recently swapped my fancy ergonomic desk chair for a stability ball. Last December, I had surgery on my hip to repair a torn labrum I got falling off my bike. By June, I was back to running a few miles and finished a sprint distance triathlon, but it still didn't feel great. 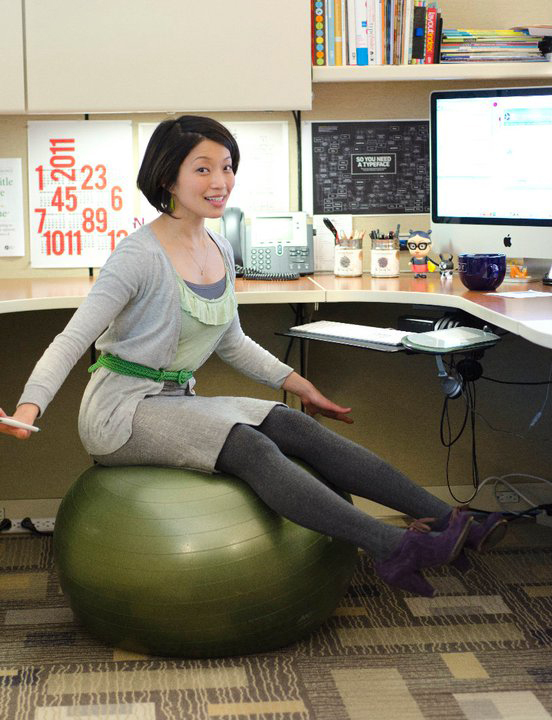 Then, I started sitting on the stability ball and now I actually feel better at the end of the workday than the beginning. And, the ball totally suits my fidgety disposition. I'm 5'4" and chose a 65 cm ball. I don't fully inflate it so my feet hit the floor. It's the perfect height for my desk. I recommend the Thera-Band Pro Series SCP Stability Balls balls from Perform Better. At $38.95 it's a great deal. Especially when you compare it to the versions mentioned in this New York Times article -- $225 for a ball? If you work at ASHA, feel free to borrow a ball from the exercise room to see how you like it before ordering one. Just pick it up after 8:30 and return it by 4:00, so it's available for our fitness classes. Many thanks to Emerald for letting me use her picture.